Yesterday at St. Matthew’s Erin and I both preached from Luke 4: 1-13, the temptation of Jesus. Each Sunday we preach from the same text, it’s one of the things that we to do help our church be unified through our three services. By the way, you can listen to any of our sermons by visiting the podcast portion of St. Matthew’s website. As I read this text, there were (at least) four things that jumped out to me about temptation. And maybe this is one of the reasons Jesus was tempted, to show us how to resist it. 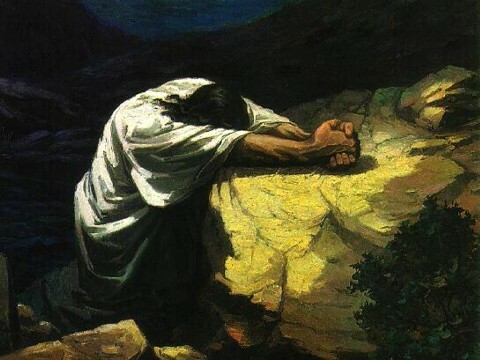 First, notice the devil attacks Jesus when He was weak. It says that Jesus had been fasting and was famished. And that is when the devil came at Him. You will face temptation. You will. Know that the devil knows your weakness. He will hit you there. You will face temptation in the spots where you are your weakest. Be aware. Be on guard. Know these places, know these spots. And don’t give temptation a foothold. Don’t play with fire. The devil knows where you are most vulnerable. Be on watch in those areas. Second, the devil tries to make Jesus doubt. He tells Jesus, if you are the Son of God. Jesus knew who He was. The devil tried to make Him doubt. The devil will make us doubt. He’ll try to make us doubt God’s love. He’ll try to make us doubt our worth. He’ll try to make us doubt God’s truth. He will do all in His power to put those doubts in our minds. Don’t let him. Because you have to remember number three. Third, the devil lies. If you don’t remember anything else about temptation. Remember this. Temptation is a lie. Temptation is a lie. It always is. It looks good. But it kills us. In the text the devil says that all authority has been given to him to give to whomever he wants. Nope. That’s God’s call, not His. He is lying. Temptation is always a lie. When you hear that voice, tempting you, always know that voice is a lie. If the devil’s lips are moving, they are lying. Temptation promises life and fun and ends in destruction. Temptation is always lie. And last the devil misuses scripture. In the text, the devil quotes the bible to Jesus. But he is misusing it. Not everyone that quotes the bible is of God. Know your Bible. Remember your context. Be aware of the truth of God’s Word. The devil will try to use the Bible for harm and for destruction. So that means that you have to know the Bible for yourself. Read it. Study it. Pray with it. Make it yours. When you know the Bible, you will better be able to stand against those temptations. Temptation is coming. We will all face it. Jesus faced it, so will we. And when it comes, may we find the grace to stand against it. Jesus Christ is Lord of all. He is the very Son of God. The Bible tells us in Colossians that everything in all of creation was made by Him and through Him. He holds everything together. He is the source of life, the source of strength, the source of everything that is good in life. He sets the example for us. The word Christian means a follower of Christ, or sometimes “little Christ.” As Christians, we are commanded and called to live as Christ would have us to live. What did Jesus do? He served. He served in the must humiliating, demeaning fashion. He served His disciples. 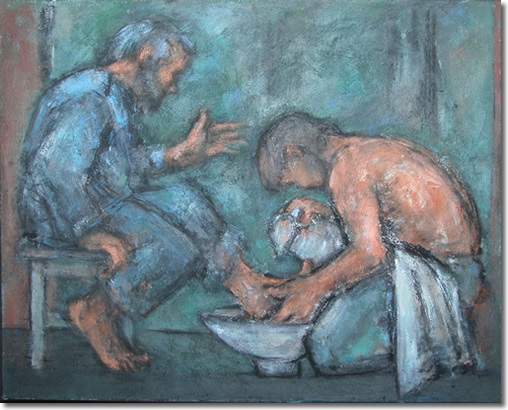 He washed their feet. He set an example. Today, our command as Christians is not to walk around beating our chests. It’s not to act like we are better than others. It’s not to look down our noses at others. It’s not beat other people up. It’s to serve. Our calling today is to serve others. Our calling today is to follow the example of Jesus and place others ahead of ourselves and serve them, serve their needs, love them. In loving them, we show them Jesus’ love for them. In serving them, we show them their worth. In serving them, we follow the example set by our Lord. We will not be able to argue someone into the kingdom of heaven. But, we can love them in. We can serve them in. Jesus showed us that example. He showed us what we are to do. He served His disciples. And He calls us to serve each other. Today, in your life, find a way to serve someone. And in doing that, you will be showing Jesus example of love. And in that, He will be glorified, and folks will know His love. Today, he set an example for us. Today, may we follow.